And I just snore some more?" Sitting up in that tree?" But the empathetic Annie is also worrying about Mama, left alone at home. And miss me a bunch?" "We will get used to this. We both have to try. Or what you might do." 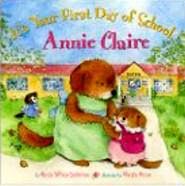 Despite the promise of new experiences, the first "first day" of school also has a bit of sadness for both parent and child, and Nancy White Carlstrom doesn't gloss over the very real emotions of that momentous day in her latest, It's Your First Day of School, Annie Claire. Carlstrom, the author of the best-selling Jesse Bear books, again brings that parent-child empathy to this new picture book, ably illustrated by Margie Moore, to help ease the transition to those first days out in the wide, wide world.